The Samsung Galaxy Beam is one of the devices that might not catch your attention with its looks, silicon or performance as flagships like the Galaxy S III do, but it comes with one jaw-dropping feature - a built-in pico projector. The 15-lumen projector mirrors what you see on your phone screen and enlarges it to a ginormous 50-inch picture on your wall. It lasts for an amazing three hours and you can watch movies, play games, and pretty much enjoy everything you do on a smartphone easily on such a huge display. 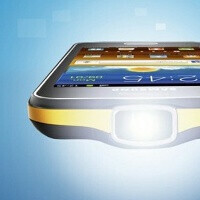 Now, finally, the Samsung Galaxy Beam has launched in the UK. It was said to have gone on sale three weeks ago, but obviously there were some problems with the launch, so it’s only available now. Still, stock is pretty limited at etailer Expansys with only 15 devices in stock. Samsung actually only officially announced the device today, so chances are that the listing at Expansys where it was listed as available came a bit too early. The Samsung Galaxy Beam price is set at around $600 (£384.99 outright) off contract in the UK, and sadly there are no news about the device crossing the pond to arrive stateside. While the actualy specs of the device are not the focus here, let’s just mention that the Galaxy Beam is not underpowered in any way. It features a 4-inch WVGA screen, the nHD projector, a dual-core 1 GHz NovaThor U8500 processor and 768 MB of RAM. Worst of all it lands with Android 2.3 Gingerbread, rather than ICS. It also features a 5MP rear camera and a 1.3-megapixel front shooter. Make sure to check out our demonstration of the projector and let us know, would you be getting this device? Ive been messing around with this phone for a week or so now,great handset. Pretty much a like many current middle to high level handset but iwth a projector. The projector is actually decent,albeit in strong daylight its a no go. Drunken bar antics are guarannteed.